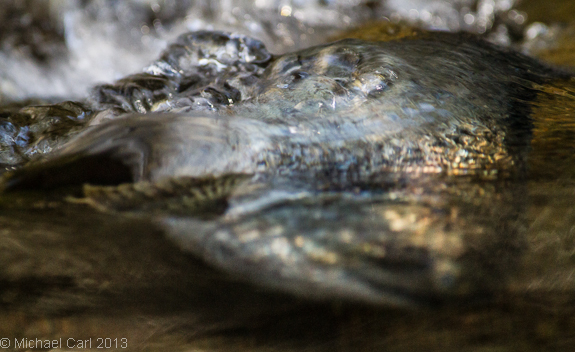 The Ecological Angler - Coho Salmon Spawning 2013 Drought. Critically endangered coho populations along California's Central Coast will likely suffer a huge blow from the drought of 2013. Droughts are always bad news for salmonids, fish which spend most of their lives in the ocean but reproduce in rivers and streams. In Central California these fish include chinook, coho and steelhead. From a timing perspective, coho are in the most danger. 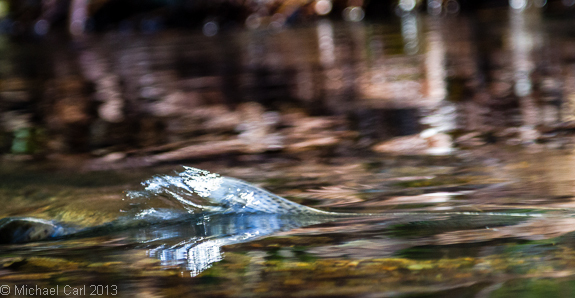 The time coho typically enter the streams along the Central Coast is December to early January. 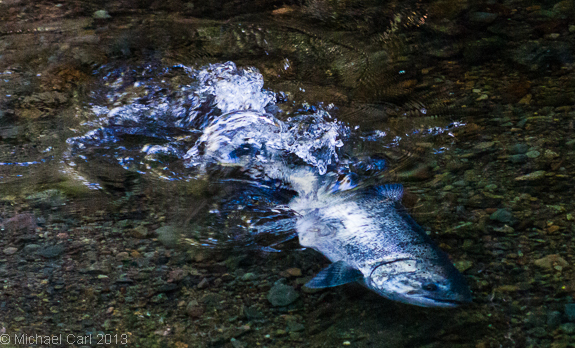 Without any significant rain in December and the first half of January, many adult coho were unable to return to their natal creeks to spawn. For these coho, sandbars at the mouth of creeks and dry creekbeds are blocking their passage to inland spawning grounds. According to Dr. Peter Moyle, The decline of coho salmon in California has probably been exacerbated by natural climatic events. The droughts of 1976-1977 and 1986-1991 have clearly made conditions worse in many streams, in some cases drying them up. 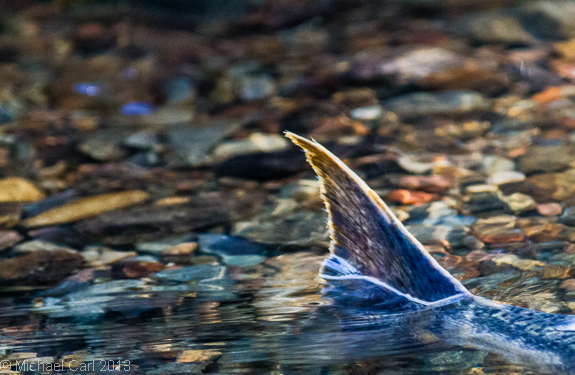 ... Coho salmon in California have no doubt persisted through worse natural events in the past, but the fish did not have to deal simultaneously with the human-related degradation of their spawning streams due to factors like water diversions and increased erosion. 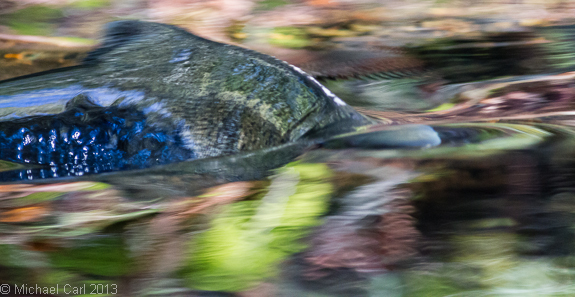 These photos were taken in mid December along Lagunitas Creek in Marin County. Forunately for these spawning coho, the Lagunitas watershed has a couple of factors which work in their favor during dry winters. First, they don't contend with any sandbar blocking the entrance to the creek at the coast. Second, the construction of Kent Reservoir allows for additional instream flows to aid the fish in their migration along the main stem of Lagunitas Creek. That said, the additional instream flows do not aid fish looking to spawn in the smaller tribs of this watershed which include Devil's Gulcth and San Geronimo. 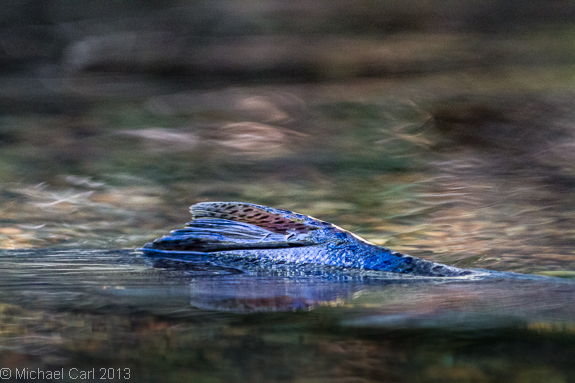 Above - a female coho salmon builds her redd by sweeping her tail on gravel Lagunitas Creek in Marin County. The power generated by her tail dislodges sand and sediment allowing the stream's current to move it downstream.